Being first-to-market with the latest wireless infrastructure can help drive local economic development. That said, according to industry analysts, the introduction and deployment of 5G communication services will take a different path to market. Therefore, mobile network operators cannot rely on previous methods of implementing 4G networks. 5G needs ultra-low latency at the edge. A reduction in network power consumption is also a key requirement. According to the latest worldwide market study by Juniper Research, the total number of cellular machine-to-machine (M2M) connections will reach 1.3 billion by 2022 -- that's a 220 percent increase from an estimated 400 million in 2017. The new research found that emerging cellular networks -- including NB-IoT, LTE-M and 5G -- will grow together to account for just under 10 percent of all cellular M2M connections by 2022. Mobile network operators are now racing to provide the underlying connectivity for the future high growth of the anticipated M2M connections, spurred on by the emerging use cases. The market study also found that smart city development will benefit from Low Power Wide Area (LPWA) access technologies. It's estimated that over 25 percent of cellular smart city devices and associated applications will operate over 5G networks by 2022. The low-cost per connection of LPWA networks and a battery life of 10 years will become appealing for monitoring city operations, including public transportation and public energy infrastructure. Juniper Research believes that 5G technology will be essential in handling the increasing data traffic generated from smart city devices. They've discovered that services such as traffic information and citizen gateways will generate over 160 Petabytes of data traffic per year in 2022. 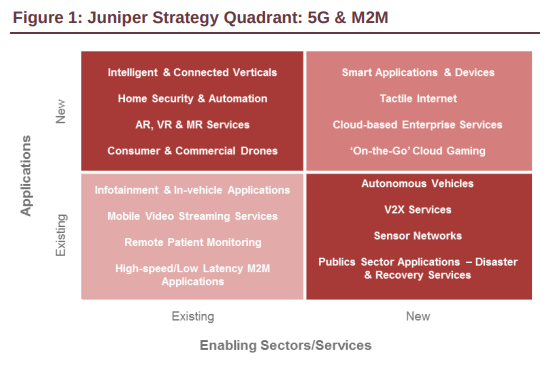 In response to this increase in cellular traffic, the Juniper assessment suggests that transforming wireless network architecture would become key to delivering the level of smart city services that have come to be expected by the various stakeholders. "Edge computing will provide the necessary network capabilities for the provision of services. Decentralizing network functions, by moving them to the edge, will facilitate the ultra-low latency and faster processing power needed," said Sam Barker, senior analyst at Juniper Research.